Wind Energy has been based on closed and liquid moulding so it is very important to have the trusted resin arrival timestamp at critical locations in or around the cavity. Resin arrival signals may be necessary for opening or closing feeding or evacuation lines when the resin has exited the cavity from a specific gate. Also resin arrival indication can contribute to the calculation of the ‘real’ permeability of the fibre preforms either in specific lab-devices or even at the real moulding conditions. This can be done by placing specific small film sensors into the cavity. Resin arrival can also help manufacturers measure the through-thickness permeability of the preforms which in some applications can be very critical for the quality of the part. In most of the applications just for resin arrival or temperature recordings Optiflow and Optiview are used. 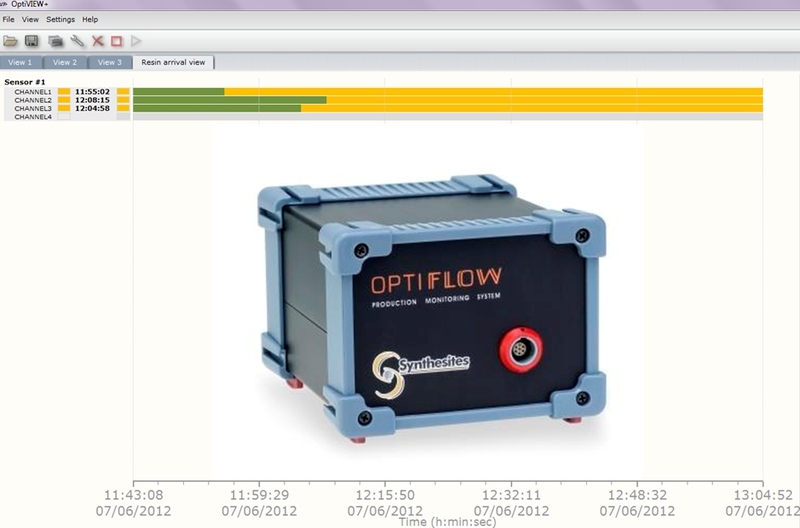 Optiflow can track up to 4 sensors while Optiview can handle up to 10 Optiflow simultaneously. The Optiflow system possess the unique capability of continuous check of good contact between the monitoring system and the sensors so it is always safe to use this system especially in large windblades where wiring can be long and complex. Real-time Resin Arrival information can also help to automate the manufacturing process through the available relay outputs. For quality control purposes both temperature history and resin arrival timestamps are recorded and stored in the computer. Resin arrival can be measured either by disposable flexible sensors or with permanent ones. The permanent sensors can be installed either in the cavity or at the inlet/outlet gates or at the feeding/evacuation lines. Furthermore, when both resin arrival and cure are considered, the use of the more accurate Optimold system can be considered. When resin arrives at the sensor a relay output opens and Optimold continues to monitor resistance and temperature for cure monitoring.